Q: We’re excited to talk with you about your new book about Karl-Friedrich Bonhoeffer! What initially drew you to Karl-Friedrich as a subject for your book, especially considering the immense popularity of his youngest brother? KH: The road to Karl-Friedrich Bonhoeffer as a subject was ruggedly circuitous. I took the first step on that road many years ago when I read Dietrich’s Letters and Papers from Prison. I had borrowed my father’s worn-out copy that had dramatic black bars on the cover with the subtitle Prisoner for God. It was a shortened version measuring only half an inch thick. By contrast, the Fortress Press version, published in 2010, is two inches thick. Although I own that new version, I will never throw out the old one with my father’s notes in the margins because it opened up for me, a young questioning Christian, a way to continue to believe. I think it served the same purpose for my father. Initially I was attracted to Dietrich’s martyr status as part of the resistance, but in the long run what really mattered was his compassionate attempts to be wholly present in a broken world. About six years ago, I decided to read some of the books that Dietrich was studying while in prison. My reasoning was that in so doing I would grapple with the same ideas, thereby coming closer to understanding where Dietrich’s thinking was headed. Because I am interested in the borderlands between religion and science, I set at the top of the list Carl Friedrich von Weizsäcker’s book The World View of Physics. Weizsäcker was a theoretical physicist and a colleague of Karl-Friedrich, who sent the book to Dietrich. Unfortunately, the book got pushed down the list when my son fell seriously ill with Hodgkins lymphoma. Knowing I could never read a scientific text while sitting in a hospital waiting room, I turned instead to Adalbert Stifter’s novel Witiko, which also was very important in shaping Dietrich’s thinking. The upshot was I wrote two essays, “Daring to Do the Good: The Bohemian Knight and the Martyred Theologian,” published in the journal Image in 2016, and a longer essay scheduled for the upcoming Bonhoeffer Yearbook. After my son’s health began to improve, I returned to The World View of Physics—only to be stopped again. This time the cause was a comment from Roald Hoffmann who is a Noble Laureate in Chemistry and professor emeritus at Cornell University. Hoffmann spent over a year of his childhood hidden in an attic in what is now Poland with his mother, barely surviving World War II. In his email to me, he asked if I knew about Weizsäcker’s involvement in the development of an atomic bomb. I did not. At that moment I realized that I would have to expand my research exponentially into Nazi science, which was absolutely daunting. And so I began again, in the process unearthing troubling references and omissions. At one point, it appeared to me that Karl-Friedrich was involved in atomic bomb research, despite the claim made by Eberhard Bethge that Karl-Friedrich had tried to distance himself by changing his focus to biochemistry. For me personally, this was a tough time. Was it possible that one member of the Bonhoeffer family was building Hitler a weapon of mass destruction while the other members were plotting to kill him? Doggedly, I kept going. It was then that I came across post-war letters written to Karl-Friedrich by Jewish scientists who had been forced to leave Germany in the 1930s. The letters were filled with gratitude and respect. They were often affixed to food care packages for the hungry Bonhoeffer family. I asked myself what was going on. Finally the scales fell from my eyes when I read the post-war letters of Paul Rosbaud, editor for the scientific publication Naturwissenschaften, who served as a spy for the British known by the codename the Griffin. Rosbaud revealed in those letters that Karl-Friedrich was one of his confidants during the war and also one of his best friends. Q: My first question was a bit of a misnomer because while your book certainly centers around Karl-Friedrich, it isn’t merely about him in the traditional sense of a biography. This is to say I was struck at how your account of Karl-Friedrich simultaneously provides a fresh look at other individuals who often get a bit lost in traditional narratives of the Bonhoeffer family that tend to revolve solely around Dietrich. One of the individuals your book places into a new light is Karl Ludwig Bonhoeffer, the patriarch of the Bonhoeffer family and Karl-Friedrich’s father. How did Karl Bonhoeffer approach science particularly during and after WWI, and in what ways was Karl-Friedrich formed by his father’s scientific world and worldview? KH: You mentioned in your prior question Dietrich’s immense popularly. It is exactly that popularity that can blind us. To overcome that blindness, it helps to approach the Bonhoeffers from a new direction, which means crossing disciplinary boundaries. When I did so, Karl-Friedrich and Karl Ludwig, the father, took on dimension, enlarging my view of the entire family. 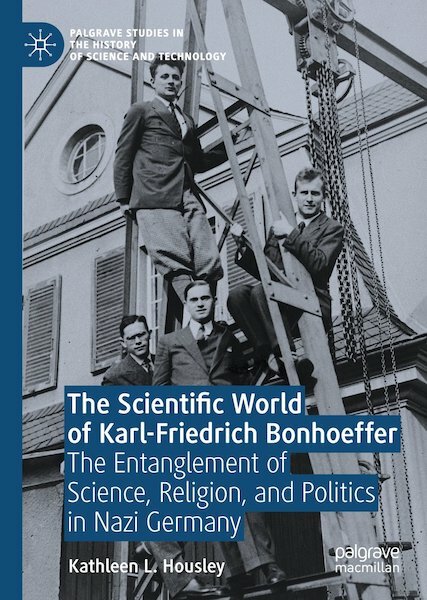 That is why my book is titled The World of Karl-Friedrich Bonhoeffer: The Entanglement of Science, Religion, and Politics in Nazi Germany. The word entanglement is a double-entendre referring to Karl-Friedrich’s quantum mechanical research, for which he was nominated five times for the Nobel Prize, and his involvement with both the resistance to Hitler and development of an atomic bomb for Hitler. Everything is entangled. My realization of the importance of his father, Karl Ludwig, came slowly. One of the leading neurologists and psychiatrists in Germany with an international reputation, he was head of the prestigious Charité Clinic and chair of psychiatry at the University of Berlin. His research focused on external causes of mental illness, such as physical trauma causing personality disorders. As a result, he became involved in issues with great ethical consequences including shell shock during WWI. Were shell-shocked soldiers malingerers who should be sent back to the front? Were they congenitally predisposed? Incidentally, these are not questions that have gone away—they recur today in Post Traumatic Stress Disorder. Karl Ludwig was also involved in eugenics, but he was very cautious, warning that not all mental disorders were genetic. Inevitably this led to clashes and compromises over sterilization and murder of mentally ill and disabled persons under Nazism. Because he held sacrosanct the privacy between doctor and patient, Karl Ludwig was circumspect about what he said and how he said it. His children revered him, but they were also slightly intimidated by him. There was never any small talk in his presence. As Dietrich put it succinctly, his father taught all his children how to “separate the inessential from the essential”—a powerful lesson to be sure! He also inculcated in his children, especially Karl-Friedrich, the importance of the scientific worldview, exemplified in the idea of pure science, which was the belief that science was dedicated solely to the pursuit of knowledge and must remain unsullied by any connections to cultural and political life. Pure science was relatively benign when times were benign, but when times were dangerous, it left scientists open to manipulation, which is what happened under Hitler. This is one of the book’s secondary themes. Q: In addition to his father, Karl-Friedrich was also shaped by his relationships with Fritz Haber and Paul Harteck—two scientists who may be unfamiliar to some of our readers. How did Haber and Harteck influence Karl-Friedrich? Moreover, how did Karl-Friedrich diverge from them—particularly considering Haber’s fierce patriotism and development of poison gas during WWI and Harteck’s involvement as a key member of the Uranium Club? KH: Fritz Haber is a study in ethical confliction. He was a towering figure in twentieth century science for his discovery of nitrogen fixation, which led to the use of artificial fertilizers in agriculture, the result being a leap in crop yields worldwide. For that breakthrough, Haber won the Noble Prize. However, as you mentioned, he also led the effort to develop poison gas during WWI, personally overseeing its first use at the Battle of Ypres in 1915. After the war, he returned to peacetime research, serving as an esteemed mentor to many young scientists, among them Karl-Friedrich who was his assistant at the Kaiser Wilhelm Institute of Physical Chemistry and Electrochemistry. The story is even more ethically convoluted because Haber’s lineage was Jewish although he had converted to Christianity. When Hitler came to power, Haber was forced out of Germany, dying in exile in 1934. His memorial service led to a crisis for Karl-Friedrich because the Nazis had forbidden scientists to attend, but Karl-Friedrich had been asked to deliver the eulogy. His solution was to have another person read the eulogy while he remained outside. There is one more grim irony about Haber: following his death, the vermin control poison that he had helped develop in the early 1920s was chemically reformulated by the Nazis for use in the gas chambers. Was Haber a good man? Was he an evil man? Haber confounds us, dismays us, and forces us to deal with murky issues. As to his influence on Karl-Friedrich, Haber played a major role in shaping his scientific career. However, there were some areas where the two men differed, one being over fierce patriotism. Karl-Friedrich was repulsed by it because of his terrible experience as a soldier in WWI. In the late 1920s, the physical chemist Paul Harteck became Karl-Friedrich’s assistant. Building on Werner Heisenberg’s work, the two men discovered the spin isomers of hydrogen. In the months leading up to the start of WWII in 1939, Harteck became affiliated with the euphemistically titled Uranium Club, which was under Heisenberg’s leadership. In fact, Harteck was the first scientist to suggest to the German high command that an atomic bomb might be feasible. And yet, he and Karl-Friedrich remained friends. Given his aversion to providing Hitler with a weapon of mass destruction, Karl-Friedrich attempted to appear helpful while not supplying Harteck and others much useful information on heavy water. Q: Your work does an excellent job at emphasizing the ethical dilemmas and ambiguities that Karl-Friedrich faced. Often your book presents him as somewhat stuck in the middle between family members who were acting in direct opposition to the state and colleagues who were complicit with the Nazis while attempting to build an atomic bomb. How did Karl-Friedrich navigate this tension? Moreover, while he rarely spoke out or directly confronted the Nazi regime, in what ways did Karl-Friedrich still attempt a type of resistance? That said, there were many ways in which Karl-Friedrich resisted. He was already an expert on heavy water at the time that the atom was fissioned in 1938 by the scientists Otto Hahn, Fritz Strassmann, and Lise Meitner. This placed him in a precarious position because heavy water became critically important to the building of an atomic bomb. However, by then the rest of the Bonhoeffers were deeply involved in the resistance. On first glance it would appear that Karl-Friedrich was in a monstrous ethical vice. But as I have already mentioned, Karl-Friedrich probably passed information to Paul Rosbaud who then sent it to the British via coded messages in scientific publications. Karl-Friedrich also harbored half-Jews in his laboratory, which led to his being denounced by a Nazi professor, although he did not lose his position as a result. Q: How was Karl-Friedrich’s scientific research on heavy water significant to the German efforts to develop an atomic bomb? Moreover, how would you characterize Karl-Friedrich’s participation in the Uranium Club and in the German atomic bomb research more broadly? KH: Karl-Friedrich’s research on heavy water—deuterium oxide—began in 1933 and was in line with his work on hydrogen. The fissioning of the atom caught the world by surprise. He could not have foreseen that heavy water would become important as a means to slow down neutrons so that an explosive reaction could take place. Bethge was correct that Karl-Friedrich attempted to distance himself, but he never could do so completely. There are many reasons why the German effort to build a bomb failed while the American effort succeeded, if you can use the terms failed and succeeded in this context. After the war, Heisenberg and Weizsäcker claimed repeatedly that they knew how to build a bomb but prevented it from happening, suggesting they had more moral courage than American and British scientists. However, the historic records prove otherwise. The failure was mainly due to economic and organizational problems. It was not due to the moral opposition of German scientists to a weapon of mass destruction. After the war, Karl-Friedrich’s views became clear. For example, at one point he defended the physical chemist Robert Havemann who spoke out against the nuclear arms race between the USSR and the United States. Q: The correspondence between Dietrich and Karl-Friedrich is woven like a melody line throughout your book. In fact, by reading your work it’s as if we get to see Dietrich in a fresh light from the perspective of Karl-Friedrich. What stands out is the way that Dietrich seems to consistently push and subtly encourage Karl-Friedrich to be more outspoken in his opposition to the Nazis. How did this correspondence with Dietrich affect Karl-Friedrich? Additionally, what were some specific moments where Dietrich’s voice strengthened Karl-Friedrich’s courage to resist? KH: First, I must mention that I could not have written The Scientific World of Karl-Friedrich Bonhoeffer had not the multi-volume Dietrich Bonhoeffer Works (DBW) been published by Fortress. Prior to its publication, some of Dietrich’s works were shortened or available only in German. I am in awe of the amount of work and dedication that the team of editors and translators put into DBW. I began with the first volume and read through the last. Another example took place in the summer of 1939 when Dietrich, Karl-Friedrich, and Werner Heisenberg were all in the United States at the same time. Their itineraries differed but their paths crossed in significant ways. There is no doubt that when the three men sailed back to Germany barely a month before the invasion of Poland, the Bonhoeffer brothers were returning to help defeat Hitler, and Heisenberg was returning to help Hitler win. Q: Eberhard Bethge and others have previously noted the ways that Karl-Friedrich’s scientific worldview and reservations concerning Christianity had a marked effect on Dietrich’s late theology written from prison. Your work picks up on this connection as well, however, you also uniquely interrogate the impact of Carl Friedrich von Weizsäcker’s The World View of Physics. How did von Weizsäcker’s book help give rise to some of the now famous concepts in Dietrich’s prison theology? KH: The World View of Physics helped Dietrich formulate his nascent idea that God is found in what is known instead of unknown—the gaps in knowledge—in a world-come-of-age. That idea did not mean an ethical growing up but a maturation of the believer away from the concept of an all-powerful God and toward the concept of a God who was powerless by choice. As Dietrich wrote to Bethge in July 1944, “Before God, and with God, we live without God.” Previously Karl-Friedrich had given him Paul de Kruif’s Microbe Hunters, another important book in shaping Dietrich’s thinking. Many of the physicians De Kruif wrote about were atheists who saw their medical breakthroughs as due to science as practiced by humans without miraculous intervention. There are no extant letters between the brothers in which they discussed the subject of science and religion directly. Karl-Friedrich’s approach was to send Dietrich books that he thought were influential. Q: Of the four Bonhoeffer brothers, Karl-Friedrich was the only one to survive both world wars. How was he received during the post war period, especially as a German scientist? Additionally, how would you ultimately appraise his legacy in light of everything we now know about the horrors of WWII. KH: The Bonhoeffers and others who were opposed to Hitler were vilified after the war. Even at Karl-Friedrich’s funeral in 1957, his family’s involvement in the resistance was barely mentioned. However, Karl-Friedrich’s role in rebuilding science in Germany after the war was remarkable. Besides the shattered buildings, there were the shattered relationships. To repair those relationships, Karl-Friedrich reached out to Jewish scientists who had been forced to leave Germany. The biographies of Dietrich stop in 1945, but there is more to the story. I am not able to accurately assess Karl-Friedrich’s legacy, particularly in regard to the many scientists that he influenced. At least two of the young people he mentored were awarded Nobel Prizes. New material is still coming to light; new insights are still being made. If there are boundaries to Karl-Friedrich’s legacy—clear delineators of beginning and end, of cause and effect—I cannot discern them. One barrier is that he was not as prolific a writer as was Dietrich. There is a big difference between authorship of a scientific paper and a sermon. Dietrich may have been a theologian, but above all, he was a pastor. For him, even Tegel prison was a parish and his fellow prisoners were parishioners. Although words sometimes failed him, more times than not he was able to express what mattered to listeners and readers. We are all the richer for his skill. Karl-Friedrich, however, was not that way. As a physical chemist, his world had the insubstantiality of quantum mechanics and the substantiality of classical physics and chemistry. Few people had the requisite brilliance to understand his scientific papers other than his colleagues. Put simply, he was a good man caught in terrible times, trying his best to do right by everyone—succeeding here, failing there. Q: What are you working on now that The Scientific World of Karl-Friedrich Bonhoeffer has been published? KH: Next spring, I am teaching a class at Trinity College in Hartford coupling Dietrich’s “After Ten Years” with Martin Luther King’s “Letter from Birmingham Jail.” The resonance between them is strong. I also think it is vital to show Dietrich’s relevancy.